By this time, the months of weekly chemotherapy were talking a toll on Kai’s little 1 year old body and we were spending more and more time at home, a shift in lifestyle that was hard on both of us. The therapists and support people who came to our house each week became my lifeline. Their visits gave us a schedule and purpose, always teaching me new ways to help him get through. There were days I waiting by the window, desperate for another adult to hear the things that were racing through my mind – was I doing enough to help him? Did they see what I was seeing? What if he doesn’t survive? On our most difficult days I would count the hours till their visits – the one hour that day where I wouldn’t be alone with him. Throughout our experience with the palliative care program, our most consistent and valued service became our volunteer Jen. We were first matched with a different volunteer who was very nice but obviously overwhelmed by Kai’s illness – understandable when you witness the life of a two year old with brain cancer. When we met Jen she appeared calm yet confident. We didn’t seem to scare her. She showed up with a compassion that was genuine but not overwhelming. Most of all, she brought with her a willingness to witness our life as well as the skills of an experienced mom. At first it felt uncomfortable to have a volunteer coming to help me. 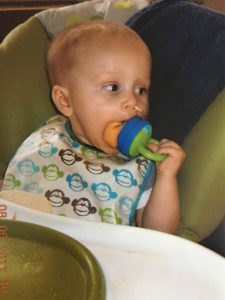 I was Kai’s mom and it was unsettling to admit I needed so much help caring for my baby. The more help we required the more I had to face how different our life was becoming from that of a typical family. All of the other people coming into the house were there for specific therapies for Kai (although they each certainly supported me in various ways as well); but Jen was simply there to lend a hand. She had no goals of care or agenda and honestly I wasn’t sure how she could help us. She offered to help with laundry or cleaning or to cook a meal, but I hesitated. On Jen’s first visit I shared Kai’s story with her as I fed him lunch. Jen instinctively picked up the pieces of food Kai threw on the floor and handed me a paper towel when I needed to wipe his hands and face. I explained that due to his tumor or the medicine or both, he was having trouble swallowing and slowing losing the ability to feed himself. Many days he simply had no appetite at all and any food I did get in him often came back up from the chemo-induced nausea. His weight was closely monitored by his medical team each week, which also felt like a constant testing of my parenting. Jen sat with us for an hour – 30 minutes of Kai in his high chair working to grasp each little bite of peanut butter sandwich followed by 10 minutes of offering a bottle – him taking small sips here and there – and then hooking him up to his feeding pump to supplement the rest of the nutrition he needed to maintain his weight. This was the process for each meal at the time. We spent hours each day on feeding, not to mention the time preparing his blended diet, overnight feeds, medications and extra hydration when necessary. From then on Jen came at lunch time. She would sit with Kai, read him books, play with his toys and help him with his lunch. I grew comfortable to step into the kitchen to prepare his next meal or fold laundry as we talked. She held him and fed him and read him books, treating him like any other baby. Her presence for that one hour each week offered so much. I came to really count on our weekly visits. We quickly became friends as she would update me on her family and she grew to love ours. During the last weeks of Kai’s life, which we spent in the hospital, Jen wrote notes checking in on us and sending her love. After his death, she sent thoughtful gifts and shared beautiful accounts of her time spent with Kai and she made it clear just how much Kai impacted her life. I met up with Jen this weekend, 4 ½ years later. After all this time, while so much has changed, seeing her face, hearing her gentle voice and feeling her calming presence brought me right back to our lunch time visits with Kai. As we reminisced about those days, her stories reminded me of the mom that I was once, a memory that continues to fade as the years go by. We laughed as she described the look that Kai gave her as he distracted her so he could drop a piece of food over the high chair on the floor for the dog. Listening to her memories of Kai reminded me that he had relationships outside of me and memories outside of illness during his tiny little life. She brought me back to a time when my life was full. When I was forced to open my door and ask for help. She reminded me that it really does take a village and that a one hour lunch date can lead to a lifetime of memories. Thank you to Jen and all of the hospice volunteers who give of their time and their comfort to stand with us in our darkest hours.